25 tweets are all he has, since the 11th of February 2009. This guy, currently head of Cloud and Enterprise (which accounted for $20.3 billion in revenue & $8.2 billion in operating income during the company’s last fiscal, in case numbers interest you like it does him) at the world’s biggest software giant, Microsoft, is known in the circles as Mr. Nice Guy. And this low-profile gentleman just pipped Ford boss Alan Mulally and Nokia chief Stephen Elop to replace Stephen Ballmer as the new CEO of Microsoft. The only third chief executive in the company’s nearly four-decade-long history. Honored. Humbled. Excited. These three words came to Satya Nadella’s mind when few hours ago this six-month long floating rumor became true. And a not-so-surprising news that Bill Gates would step down from his role as chairman and become a technology adviser to 46-year old Mr. Nadella. Mr. Gates will “devote more time to the company, supporting Nadella in shaping technology and product direction.” See this welcome video. And yeah, the new chairman would be John W. Thompson, a Microsoft board member and lead independent director. 1 Why was Satya chosen? Microsoft’s directors selected both a company insider and an engineer, suggesting that they viewed technical skill and intimacy with Microsoft’s sprawling businesses as critical for its next leader. Note that Microsoft was more successful under the leadership of Mr. Gates, a programmer and its first chief executive, than it was under Mr. Ballmer, who had a background in sales. In his first interview where he was extremely determined and confident of the future, he said he “ruthlessly wants to remove any obstacle stopping innovation.” Looks like he has already taken guard! 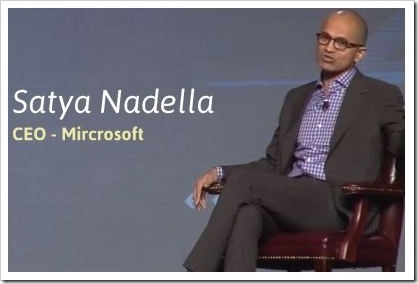 Nadella worked for Sun Microsystems, as a member of its technology staff, prior to joining Microsoft. When Mr. Nadella joined Microsoft in 1992, with degrees in electronics, computer science and business administration, it was still a scrappy, relatively small software company led by Mr. Gates that was just beginning its greatest years of growth. Mr. Nadella’s stardom at Microsoft rose considerably in the past several years as he took charge of the company’s cloud computing efforts, a business considered vital as more business customers choose to rent applications and other programs in far-off data centers rather than run software themselves. But for years, Microsoft had not paid enough attention to how the cloud — primarily through services offered by Amazon, its crosstown rival — was attracting the creativity of a new generation of developers. Finally, when he got control of the division that included Microsoft’s cloud initiatives, Mr. Nadella changed that. He began meeting with start-ups to hear more about what Microsoft needed to do become more responsive to their needs, something which Microsoft rarely did. He previously led its server and tools business before being put in charge of the unit that built Microsoft’s Cloud OS service, which powers products such as Bing, Skype and Xbox Live. Hyderabad is second time lucky. Microsoft’s first development centre outside the United Stated here in 1998 that began the transformation of the city of pearls into ‘Cyberabad’. And now Satya, son of a retired IAS officer. Born in Hyderabad in 1967, he went to the Hyderabad Public School. He pursued his Bachelors in Engineering from Manipal in Karnataka and later went to the US for postgraduate studies, a trajectory many engineering students from the state — usually the Telugu techies — follow. Been married for 22 years and has three children, he counts cricket and poetry among his hobbies. He loves to learn and has a child-like enthusiasm for new things. A whippet-thin runner, he is known as a cerebral, collaborative leader with a low-key style that differs from Mr. Ballmer’s bombastic manner. He admits he buys more books than he can finish and sign-up for more courses than he can complete! And yeah, insiders say he is not a pushover as a boss. This is the post-PC world. The new CEO still has to work out where to point Microsoft in a world increasingly dominated by tablets and software that resides on the cloud. As the CEO of the entire 100,000-person company, Mr. Nadella will have to grapple with a much broader set of challenges in markets in which he has little experience but is the future, like mobile devices. He will inherit a deal to acquire Nokia’s mobile handset business, along with its 33,000 employees, and a wide-ranging reorganization plan devised by Mr. Ballmer and still in progress. He also has to create the app ecosystem that Google and Apple have so wonderfully done. Some critics have questioned whether Mr Nadella is the right man for the job. He has no experience of running a company, let alone one as big as Microsoft. But the market felt otherwise. Microsoft scrip rose 0.7% to give him a welcome. Not a warm one though. He may decide to sell off the Xbox and Bing businesses as some analysts have argued. It is also possible that Microsoft sells Bing either to Facebook or Yahoo while shopping the Xbox business around to a consumer electronics company where it would make a better fit. With the way he has started leading this behemoth, a few incompetent heads are sure to roll too! Only time will tell if he will be street-smart and make decisions like porting Office to iPad, and add roughly $2.5 billion a year to his kitty. Or restore the legacy of Windows OS in mobiles as it has in desktops. Or ensure the turnaround of Windows 8? Will he be able to make use of the extremely talented resources and services at his disposal? And with the legendary Gates as his advisor? Wait and watch this space for more! The Transparency Reports Aren’t So Transparent After All!